Alex Grecian is the national bestselling author of the “Scotland Yard Murder Squad” novels, including The Yard, The Black Country, The Devil’s Workshop, The Harvest Man, and Lost and Gone Forever. He has also co-created two critically acclaimed graphic novel series: Proof and Rasputin. Other works include the original “Murder Squad” e-book, The Blue Girl, and an original graphic novel called Seven Sons, as well as a multitude of short stories, both comics and prose, for various anthologies and magazines. He lives in the Midwest with his wife and son. 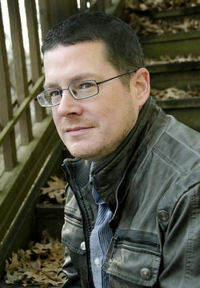 He is working on the first book in a new series of contemporary thrillers that will be partially set in Kansas.